In the fall I discovered that I was not supposed to be doing the digital presentations in this class. I am disappointed for several reasons. I may work on a post about that. What that means for the schedule is that the researched essays (8-10 pages) have a final due date of two weeks before finals. When we were doing the digital presentations, the researched essay final version was due one week earlier. That means we have one additional week for work on the researched essay. One student went to the chair to say that I had unfair grading practices. He did not come and speak to me about it and I have no idea who the student was. At the time, I was at a loss for what the problem might be. I discussed with the chair the only person who had spoken with me, but that was not the issue presented to her. My best guess is based upon that extra week of class and the fact that I added a few drafts, where I checked for one or two things only. I told the students the drafts were due. Then, after they had turned them in, I told them what I would be checking for. Every student was given comments in Canvas on the drafts. Those comments were ONLY related to the points that I said I would grade for. Because drafts were daily grades and my comments were intended to explain what the students needed to fix/change/address for the final version, those drafts were typically given As–if they were turned in on time and fit the parameters of the assignment generally. I considered the grades more of a completion grade. If, however, as I suspect, students only checked their grades and did not read the comments, they might have assumed that they had done the assignment perfectly. That seems a bit naive to me, but I can imagine it happening. Under those circumstances, I can see where the final grade for the assignments, which were graded for all aspects of the assignment as given by the rubric, could be a shock. I had decided this was the problem as of the researched essay. Therefore, for the draft/partials/completion grades for the researched essay, I did two different things. First, I muted the grades, so that the students did not see them. I did not unmute them until both classes had met. 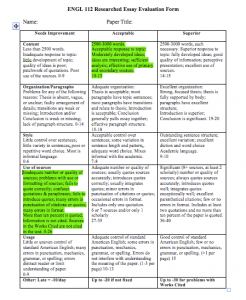 Second, I provided printed copies of the rubric, with the aspects I was grading highlighted. The other sections were CLEARLY not highlighted and I told everyone (verbally, with a note on the board, and some other way I don’t remember) to check the comments on Canvas. Students check for grades and do not read the comments on Canvas. I had realized this prior to the above situation/resolution attempt. What I did throughout class for final grades was that I muted the final grades. After class I unmuted the grades so that people could see what specific scores they earned. This did NOT make them go read the comments, but it did, at least, let them clearly know (and focus on, since it was the only information they had) which areas they needed to improve and which they did well. If I were still grading by hand, the comments would be on individual papers/rubrics. These would be shuffled into folders or the wastebasket and would not be as readily available for later perusal. In fact, last semester I realized that the comments on the sheets weren’t being read and started putting all comments in Canvas so that at least I didn’t have to re-write over and over the same points that were not being addressed. When I post comments on a draft (1.0 or 2.0) and these comments are not addressed in the final version, it is clear that the student did not value the instruction. A different system won’t fix that. So, no, Canvas is NOT the problem. “Deliberative practice is characterized by a high degree of focused effort to develop specific skills and concepts beyond one’s current abilities” (Schwartz, Tsang, and Blair 39). Students (and perhaps faculty too) often mistake practice for deliberative practice. Our memories have limited capacity, so we can’t learn too much at one time. Therefore we need to chunk information–for ourselves and for our students. “Over time, engaging in deliberative practice changes people’s knowledge organization, making it more specialized for the tasks they regularly face” (43). That is an interesting aspect of the idea of deliberative practice and may help students understand why they have to have another writing class when they have been writing for the last 12 years in school. Deliberative practice, however, doesn’t take place during the meaningful activity itself. This means if we want students to practice changing their sentences for style (a fairly basic point), they should be practicing BEFORE they write their next essay. How do we add that to the curriculum? Obviously exercises, where we provide the sentences and they change them, would work. But then they aren’t their writings. Maybe start there. Then have students find a paragraph they have already written and have them change it. Then perhaps incorporate the exercise into a standard class exercise, like the four-minute writing at the beginning of each class session. The ABCs of How We Learn: 26 Scientifically Proven Approaches, How They Work, and When to Use Them by Daniel L. Schwartz, Jessica M. Tsang, and Kristen P. Blair. Showing things that are similar to each other help us understand what a thing is. Showing things that are different also help us understand. I find it odd that these were presented in the chapter in the opposite order. When I came to write down notes, that order seemed problematic, so I changed the order (book had contrasting/contrasting, then showing/showing ideas). Contrasting things that are very different show fundamentals. Contrasting things that are similar to each other highlight the things that are different. These can be very subtle and they are usually more important than the differences highlighted with very different examples. When giving contrasting examples, make them specific to individual things. If you wanted to learn how to tell other flowers from daisies, you might get individual “not daisies” that have a single difference and have multiple “not daisies” which have differences in color, petals, stems, and leaves. Compare/contrast alone does not allow the students to see what they need to be looking for. Instead compare/contrast with a specific function or feature in mind. I am trying to imagine what this would look like if I were having students c/c emails during the section where I teach email etiquette. I could make these up or I could go back through my emails and use actual examples (though removed from the actual emails) to give contrasting cases. Okay. I can see that working. How would I do this with introduction options–ways of writing introductions? Do I make up my own? Have to think on this more. I want people to like me. I want to be seen as being worth listening to. I want people to miss me when I’m not there. That means I want to belong. My students want to belong, too. “Learning is social” (Schwartz, Tsang, and Blair 13) and the classroom particularly shows the social aspects of learning. Students are placed into a class and we then say they belong there. BUT if they don’t feel they belong there, they will not work optimally. They might feel they don’t belong because this is too easy for them. How can we get them to feel they belong? They are the leaders? They can offer others their expertise? They might feel they don’t belong because they perceive the work as too hard for them. If that is their feeling, can we talk about placement and how we can support each other? There was a study (Walton and Cohen 2011) that had students read essays written by college seniors saying that as freshmen they felt like they did not belong, but that as they engaged with the learning environment they came to see that they did, in fact, belong in college. Students then wrote about their own feelings and recorded them on video. The study found that some students who did this was were more successful than those who did not. AND that students who had been at-risk (in this study African American students who generally had a lower GPA than the European Americans, but I can see where it would matter for first gen folks too and probably other at-risk groups that I am not thinking of) closed the GPA gap between themselves and the non-at-risk by 79%–which is a significant improvement in GPA. This particular study did NOT find an impact on the European Americans. Facilitate discussions about classroom norms and values. What is most important? Turning in homework on time or checking understanding and asking for help? Students might think that turning in homework on time is most important because that is what I grade. BUT if they check understanding and ask for help, their homework will be easier and will be done correctly and they will see the reflection of understanding and getting help reflected in the grade. Students can see themselves as belonging to the group through collaborative activities and discussions. The first few days are probably particularly important for creating a feeling of belonging. Having students meet each other in groups right away might be useful. Or having everyone in the class introduce themselves, using Vicki’s toilet paper idea, might be better. After that perhaps have groups discuss ideas about some other aspect of the class or classroom. I definitely need to think about this before school starts in the fall. Belonging increases persistence, so feelings of belonging challenged when the work gets harder needs to be countered so that students persist in the course (19). This is relevant right now as well as at the start of next semester. Being part of a group within the class increases persistence. For FYC-semester2 the casebook essay groups would increase persistence. Perhaps also dividing the research paper groups into categories (like social science research or health research) might increase persistence. That is worth thinking about. Middle school students who were asked to do a self-affirmation where they wrote about their most cherished values reduced negative issues and had improved performance in both the course they did the self-affirmation in and their other courses. While I don’t know if this would translate to college, I don’t see any reason why it wouldn’t and having students write about their most cherished values could easily be a second-day exercise. It would introduce me to their writing and it might give them a stronger sense of connection to the course. Would it be worthwhile to discuss these in small groups? Would it be counter-productive to ask how the values apply to the class? A student may seem feedback as the teacher saying “where they aren’t any good” OR as “a place they can improve.” How do we get students to see feedback as something they can improve? RIGHT NOW: I have no idea if it will, in fact, make a difference, but if I go change the titles on the rubric from Excellent, Good, Needs Work to Done Exceptionally Well, Done Well, Can be Improved maybe that would make a difference. Need to do this.